BEVERLEA WALZ PHOTO | Senior and Co-Captain Serina Kaasik has been an inspiration to her younger teammates on this year’s junior varsity basketball team. Coach Mike Mundy started his first season with the junior varsity girls basketball team with eight athletes and ended with “6.5,” as he said, due to injury and the loss of an athlete who transferred. BEVERLEA WALZ PHOTO | Shelter Island on the fast break, with Lily Garrison taking charge. Kelly Colligan giving her all on her home floor in Monday’s victory over Greenport/Southold. GARRET MEADE PHOTO | Shelter Island’s Katy Binder tries to block a tip by Greenport/Southold’s Megan Demarest. First place in Suffolk County League VIII belongs solely to the Shelter Island girls volleyball team. At least for now. It might have seemed reasonable to assume that since the graduation this past spring of outside hitter Kelsey McGayhey and setter Haley Willumsen, two of the better players to have ever worn Shelter Island uniforms, the Indians would experience a decline of sorts. Shelter Island, which has reached the New York State Class D semifinal pool four times since 2004, is still playing at a high level. The showdown between Shelter Island and Greenport/Southold, who entered Thursday’s match tied for first place, wasn’t the competitive battle some might have expected. 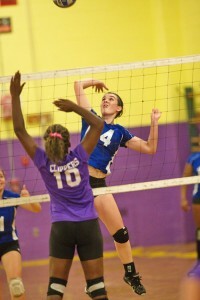 Shelter Island took charge of the match at Greenport High School and won in three games, 25-17, 25-13, 25-22. The Indians deserved high marks in all facets of their game, from serving to defense to passing to hitting. One thing remains clear: The Indians can still play. Greenport/Southold (5-1, 5-1) looked unnerved by the occasion. The Clippers fell behind by 8-0 in the first game (thanks in part to Binder’s serving), 10-1 in the second game, and were unable to recover. Their first lead came at 4-3 in Game 3 when they picked up their play noticeably. The lead changed hands three times in that game. A kill by Erin Colligan made the score 23-20 Shelter Island. Greenport/Southold kept its hopes alive when a kill by Kendra King and a block by King pulled the Clippers to within one point of Shelter Island. But the Indians benefitted from a service error by Greenport/Southold before Morgan McCarthy put a ball away for the match point. GARRET MEADE PHOTO | Erin Colligan of Shelter Island sizing up a swing while Greenport/Southold’s Kendra King attempts a block. Binder totaled 16 assists to go with four service aces, three kills and two dinks. Alexis Gibbs added six kills and Colligan had five. Shelter Island served 13 aces and surrendered only one ace to Greenport/Southold. Gibbs went 15 for 15 from the service line. Greenport/Southold received 16 assists from Megan Demarest and nine kills from Shelby Kostal, who put all 11 of her serves in play. The match was a letdown for Greenport/Southold, which had played so well two days earlier when it defeated Port Jefferson in three games. Both teams wore hot pink shirts during pregame warmups. 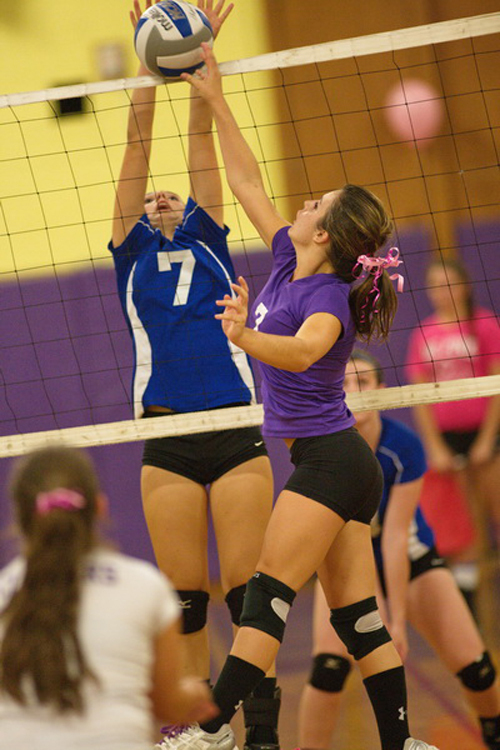 It was a “Dig Pink” match, which raised money for breast cancer awareness and research. The teams could be involved in a dramatic return match when they play their final league match on Oct. 30 in Shelter Island. That contest could decide the league championship. Shelter Island is pursuing what would be a fourth straight league title. It’s a testament to the strength of the Shelter Island program that no less than four former team members are currently playing college volleyball: Hope Kanarvogel (Unity College in Maine), McGayhey (Springfield College in Massachusetts), Willumsen (Keane State in New Hampshire) and Stephanie Vecchio (Colby-Sawyer College in New Hampshire). Shelter Island seems to have absorbed the losses of such talent as well as anyone could have expected. The small island is still producing quality volleyball players like Binder, Saverina Chicka and Gibbs, an athletic middle hitter who can crush the ball. And now they have sole possession of first place.